I’ve just come across some photos taken in 2008 and am inspired to write about John Palmer. I often talk about this beautiful man whom Kosuke and I hold in such high regard and who is so adored by our children. We call John our garden angel. He is the patron saint of many people’s gardens and indeed of this valley about which he is so knowledgeable. Kosuke and I are such black thumbs – famous for killing even pot plants – but John never gives up on us and I know he believes that one day, we will become green thumbs and we will start to grow our own food. Plant by plant, he shows us what is edible in our garden, what to pull out and what to protect. He turns up here week after week and year after year with stuff foraged from the side of the road and slowly we are covering up the grass and, with his help, creating garden beds from nothing and with no money. For me, the garden is overwhelming and intimidating. Others, like my dear friend and now cherished neighbour Kacey, take to it like a duck to water. My mother loves gardening and her father was a wonderful gardener creating a lush vegetable garden on their farm in the Hay district in NSW even in times of serious drought. My mother finds computers and technology rather daunting and difficult whereas they come quite naturally to me. My father is a technology man so I guess I inherited some of his genes. I would love to be a gardener though – I think it’s such a nurturing and health-giving past-time – much healthier than computers! What is also beautiful is to see the relationship between Taiji and John. Taiji sees John’s car and goes running out calling “John Palmer! John Palmer!” and together they explore the garden. Taiji now knows more of the plants and edibles in this garden than I do – African lettuce, south american spinach,… – so many plants considered weeds that really are nourishing foods. Sometimes I feel as though part of why John is gently and patiently teaching us about weeds is so that one day, if we ever had to, we could survive on the food that grows abundantly all around us that we are still so ignorant of. John usually finishes up with a quick song, singing about what he and Taiji have created together that day. One day, we will make John proud of our new found passion for gardening. In the meantime, I am reminded of a story in the Continuum Concept by Jean Liedloff in which she describes the culture of the Amazon Indian tribe she lived with. Each family has a garden and grows their own food, except for one man who was raised in town away from his tribe. He’s lazy, sour-faced and always complaining. Jean is surprised by how tolerant everyone is of this man and how they provide him with food grown in their gardens. His neighbour laughs and comments to Jean that the man doesn’t realise that he is unhappy because he doesn’t have his own garden or grow his own food. 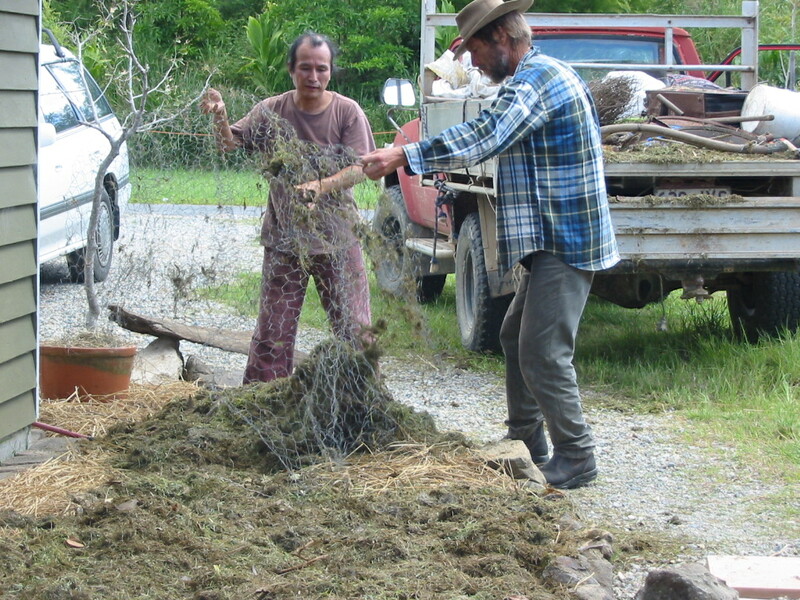 One day – after many years – the man asks his neighbour to teach him how to make a garden. He starts to grow his own food and he becomes a much lighter, brighter and happier man. I love your story abut John Palmer. Maybe he just loves the role of teaching and inspiring others to love wild and cultivated nature, and that is his reward. My father was a much better gardener than me. Except in England, I’ve never managed to have a healthy vegetable garden. I blame a lot of it on Perth’s sandy soil, where you would have to spend a lot of money on manure, mulch etc. to get anything to grow. Also on my nomad life style. But I still dream of a place in the country where I can grow fruit and vegetables. Maybe I’m already here. But it’s so hot and dry in the summer, and I don’t have a rainwater tank. I’ve made friends with the guys who run the fresh foods store in Toodyay. They say that mulching here doesn’t work, it just resists the moisture and is a fire hazard. They lost their heritage fruit orchard and vineyard in the big fire on 29th December, because the mulch caught fire and ringbarked the trees. They are slowly replanting, having working bees to do so, and planning a big one soon with a barn dance afterwards. I’ll be there! One of them told me that they use drip irrigation, and have a system based on ancient indigenous methods used in mountainous areas to catch the water that does fall and circulate it. I want to see how they do it, and try it out myself. My father gardened in a similar climate, in the Hay district on the Murrumbidgee. We had the river and a windmill to pump the water up, and he made irrigation canals and grew wheat. It was this that helped my mother cure herself of the severe vitamin B deficiency she had after I was born; she was 45 when she had me and had been through years of drought and the Great Depression. Anyway, she ground the wheat into flour and made bread from it, and it cured her. Survival in hard times was our story, and my father’s gardening was our lifeline and created a little paradise in an arid and unyielding climate. When he left, the garden became a remnant; my mother and I were too busy trying to run the farm to garden. We bought our vegetables from a neighbour who had a big garden and a Chinese garden. I’m going to post a couple of pieces about this on my writing blog (see link). Thank you for bringing this to the front of my writing desk today. Oh the lovely cosmos garden is truly delightful & an extremely tall & abundant living playground. Is the brown creature in the foreground of the first photo Taiji? I have only briefly connected with John Palmer but I’m told that he’s an exceptionally tuned in being. Thanks for honouring our friend Johnny Palmer. 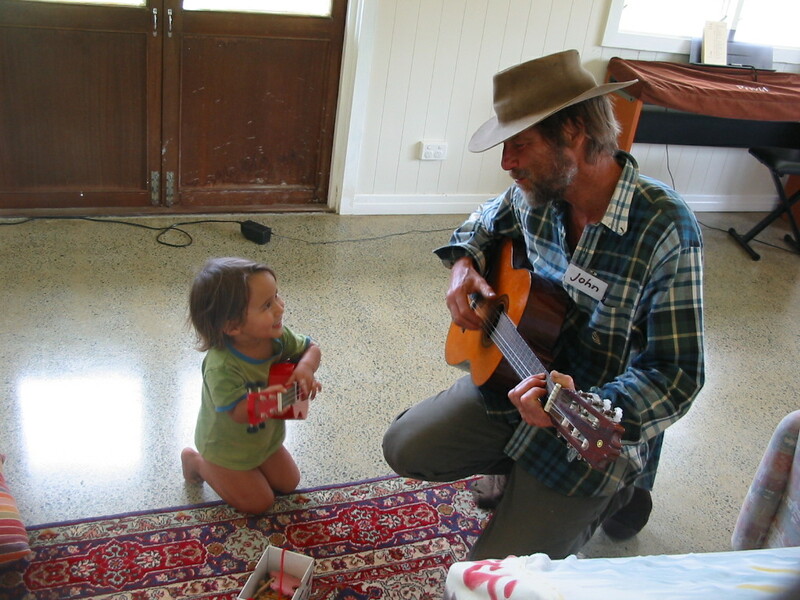 I remember when Fin (our son – now 10 years old) with his friend Mali (same age) used to do as Taiji: spot John and run singing out his name (although, they weren’t as good as Taiji at pronunciation and used to say “John ‘Tana and so John became “Johnny Sultana”). Much loved by all, whether you’re a gardener or not, John used to do sustainability classes at the EV, takes walks and wanders through the bush up at the beautiful Gwinganna and has been a renowned Currumbin Valley icon for many years. Something most people don’t know about John is that he has a OAM (Order of Australia Medal) for his outstanding contribution to the environment. Aren’t we lucky to have John in our midst – he has helped so many of us with our gardens and every now and then shows up with his brush hook to keep weeds at bay (even though he secretly loves them). Thanks for writing about John, Filippa – he’s one in a million – and it is just so beautiful to give credit and accolade where they are due. You’re right Kerry – he IS one in a million and we appreciate him more and more as time goes by, probably mostly for the magic that he brings to our children’s lives. please send me the details regarding sunday the 13th johns weeds tour?? I cant seem to find the information here we heard he is doing talk/tour on weeds this sunday??? Hi, you can find the details about the workshop here: http://johnpalmer.webs.com/workshops.htm John Palmer also has a facebook site. Love your story about my Uncle Johnny. A truly amazing soul. We are lucky to know him. Thank you for writing it. Yes we have all been so lucky to be blessed by John Palmer in our lives – especially my children. We haven’t seen him for a while – hope he’s on the recovery path. Kosuke & Filippa Araki and their two children live in an ecovillage in a beautiful green valley in southeast Queensland. They are passionate about organic and natural living, conscious parenting, quality family time, and living sustainably.